Indeterminate, 70-80 days. Plants are loaded with fruits weighing a pound or more. Excellent full flavored tomato. Consistent and very early in my opinion. Easy to peel but has somewhat of a hollow core. Ideal for fresh eating as well as being superb for sauce and salsa. 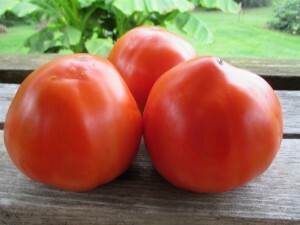 I rate this the best sauce tomato I have grown in our region of Northern Indiana. This variety succumbs to early blight quicker than the other tomato varieties I offer, but, I always get a great harvest before the plants are finished. Sow seeds indoors 6 weeks before transplanting into your garden. Space 3′ apart in rows at least 3′ apart. Tomatoes need good air movement to help control disease. I always mulch my tomatoes with straw. This helps to keep the soil evenly moist and keeps dirt from splashing up onto the leaves. Caging or trellising is crucial and I strongly recommend not using the round wire cages found in garden centers. These are perfectly suitable for peppers but not for heirloom tomatoes which can tend to sprawl or grow very vigorously. I suggest investing in a few steel t-posts and twine to create a moveable strong trellising system. The absolute best advice I can give for successfully growing tomatoes in Northern Indiana is to not plant too early. I NEVER plant field tomatoes until the last week of May. Tomatoes put in cold ground are not going to grow or develop roots until the soil warms. Seed Saving: Isolate varieties of L. lycopersicum by 35′ for home use, 50′-150′ for pure seed. seed.